Inspecting for signs of blight. Last blog, we took a look at the effects of Winter Burn, a condition that can easily be mistaken for Boxwood Blight. The biggest difference? Boxwood Blight is almost always, over time, a death sentence for affected plants. 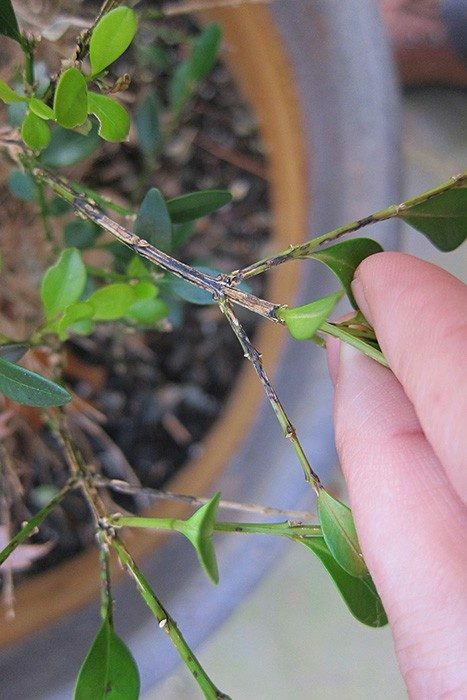 Recognizing this disease and taking preventative measures to protect your boxwoods are key. Boxwood blight, or box blight as it’s called in the UK, is a destructive fungus disease that impacts boxwoods and pachysandra, though some species and cultivars are more prone to the disease than others. English boxwood is most susceptible to the boxwood blight pathogen. The disease was first discovered in the UK in the mid-1990s. It was first detected in the US almost two decades later at a nursery in North Carolina in October 2011. The disease has made its way as far north as Massachusetts since then and can be found in isolated areas across the US. Boxwood blight symptoms can easily be mistaken for the symptoms of other diseases that infect boxwoods at first glance. Knowing what to look for is important. The fungus that causes boxwood blight, Cylindrocladium pseudonaviculatum, attacks the plant above the ground, leaving the roots unaffected. Signs of infected leaves include light or dark brown spots or lesions. These spots can merge, causing entire leaves turn brown or straw-colored. After time, “blighted” leaves eventually drop. Stems develop dark brown to black wounds or lesions. When these areas spread and merge, the stems become weak and die. Because the roots aren’t affected, the shrub may produce new growth over time. However, the fungus survives in the leaves and stems that fall to the ground as well as those that remain on the plant. Therefore, if they are not removed, the cycle begins over with new growth. Plants that repeatedly lose their leaves become weak and are unable to resist other diseases. Secondary infections eventually attack and kill the plant. So technically, boxwood blight may not be the “official cause of death” to a plant, but it ultimately leads to the demise of the plant. Avoid contact with boxwoods or pachysandra plants when they are wet – the fungus spreads by splashing water. Clean your pruning shears after every use to prevent the spread of fungus from plant to plant unwittingly. Dip them in a solution of nine parts water and one part bleach for 10 seconds and then allow them to air dry. Scrub them thoroughly with soap and water and dry them before putting them away. 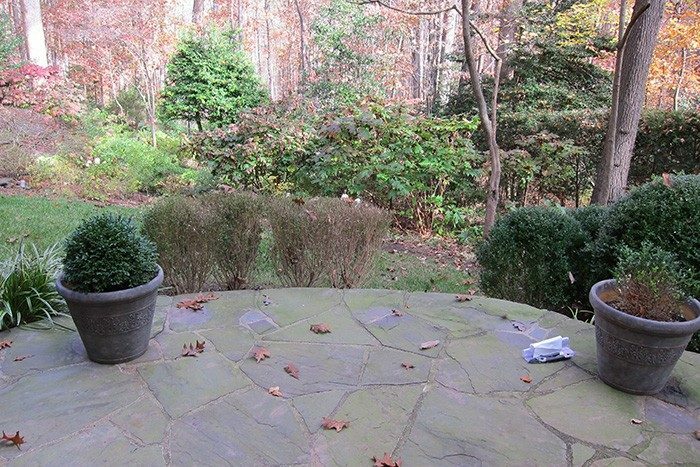 Always destroy or dispose of boxwood clippings. Never compost them unless you are 100% certain your plants are disease-free. And resist the urge to make wreaths and decorations from these clippings! Avoid planting boxwoods in partly shaded areas. The moist, humid conditions that exist in shaded areas are perfect for the proliferation of the boxwood blight fungus. 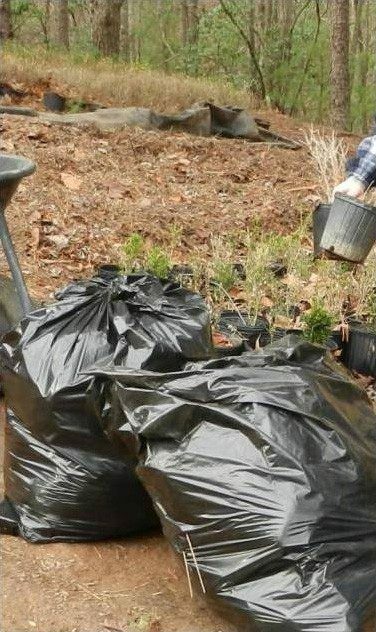 If you have diseased plants, the current recommendation is to dig them up, bag them, and dispose of them. DO NOT replant boxwoods in the same area from which you removed a diseased plant. We had a particularly rainy period and relatively mild temperatures last year, perfect conditions for boxwood blight outbreaks. The diseased leaves and stems created last year equates to lots of incubated material just waiting to cause new infection this year. And while we had some significant cold spells and wintery weather, no, that did not kill the fungus. 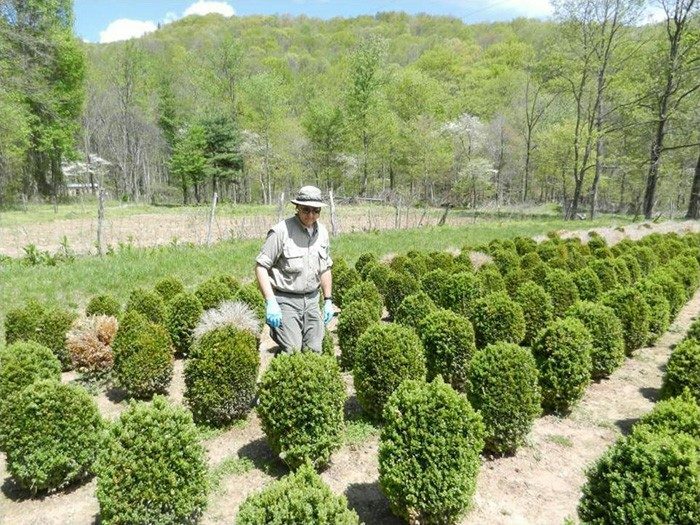 Fungicides can reduce the possibility of healthy boxwoods becoming infected, but fungicides cannot cure plants already infected with the disease. And the experts here at ProLawn are happy to answer questions and provide you with more information. Give us a call today at 540-662-8316.